UPDATE: I’ve added graphs of the difference between the observations and the models at the end of the post, under the heading of DIFFERENCE. 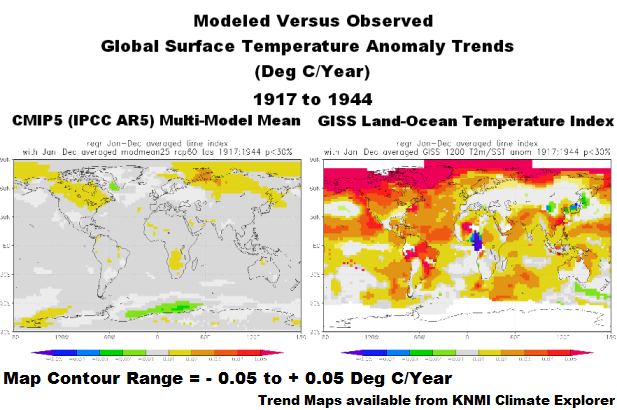 We have not presented trend maps in earlier comparisons of observed and modeled global land plus sea surface temperature anomalies, so, for the sake of discussion, we’ll provide them with this post. A comparison is shown in Figure 1 for the period of 1880 to 2012. 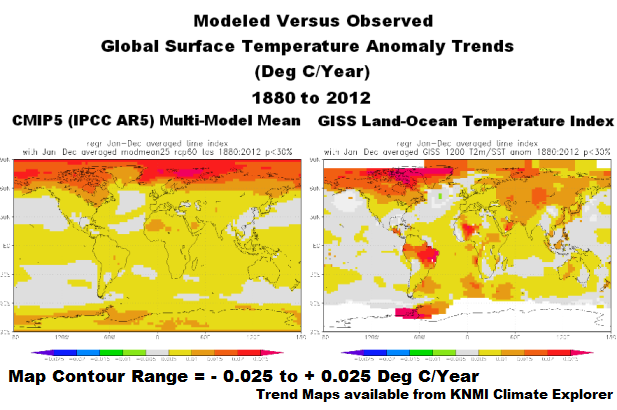 The maps in Figure 1 show the modeled and observed linear trends for the full term of the GISS data, from 1880 to 2012. The CMIP5-archived simulations indicate stronger-than-observed polar-amplified warming at high latitudes in the Northern Hemisphere. The models also show a more uniform warming of the tropical Pacific, while the observations show little warming. There are a number of other regional modeling problems. Presenting the trends over the full term of the GISS data actually tends to make the models look as though they perform reasonably well. But when we break the observations and model outputs into the 4 periods shown in Figure 2, the models do not fare as well. In fact, the trend maps will help to show how poorly the models simulate observed temperature trends during the early cooling period (1880 to 1917), the early warming period (1917 to 1944), the mid-20th century flat temperature period (1944 to 1976) and the late warming period (1976 to 2012). 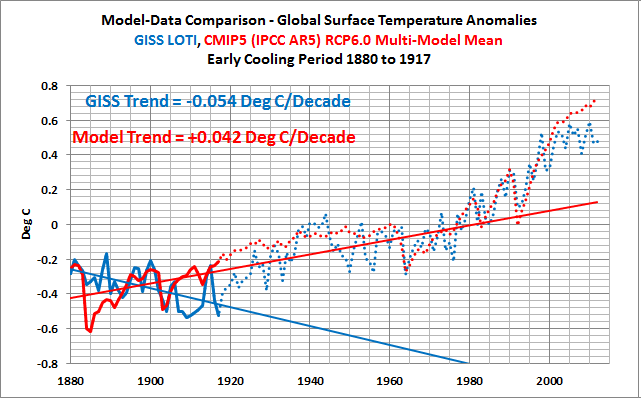 You’ll notice by extending the data back to 1880, the data shows a cooling trend before 1917. The following discussion is a reprint from the post Blog Memo to John Hockenberry Regarding PBS Report “Climate of Doubt”. In other words, IF (big if) global surface temperatures were warmed by manmade greenhouse gases, the model mean presents how those surface temperatures would have warmed. 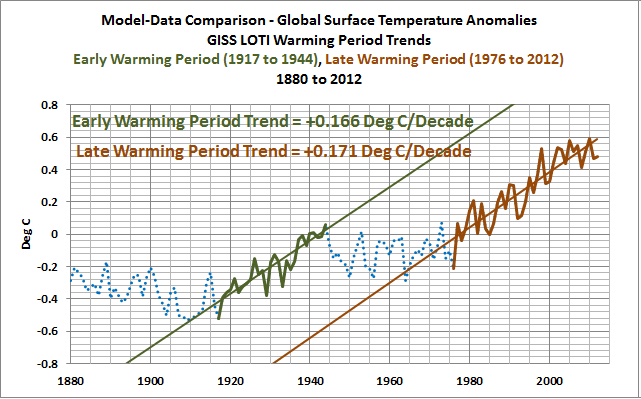 Let’s start with the time period when the models perform best, the recent warming period. And we’ll work our way back in time. NOTES: For the trend maps in Figures 4, 6, 8 and 10, I’ve used a different range for the contour levels than those used in Figure 1. The contour range is now -0.05 to +0.05 deg C/year to accommodate the higher short-term trends. 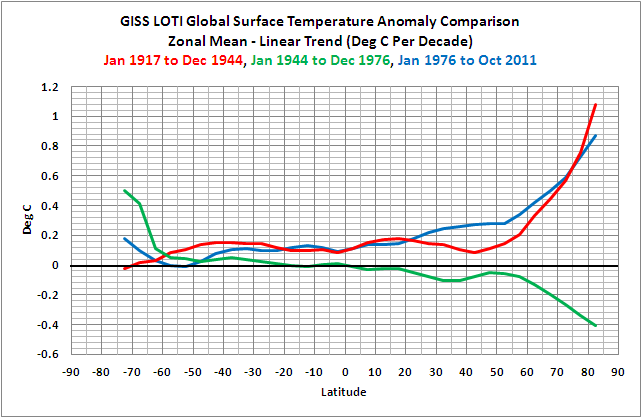 And for the temperature anomaly comparisons, I used the base period of 1961-1990 for anomalies. Those are the base years used by the IPCC in their model-data comparisons in Figure 10.1 from the Second Order Draft of AR5. 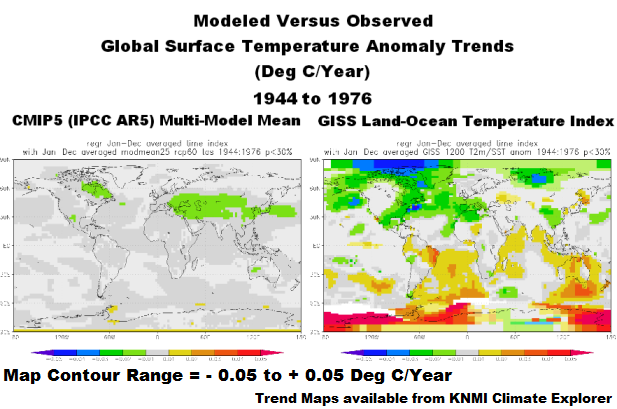 Figure 3 compares the observed and modeled linear trends in global land plus sea surface temperature anomalies for the period of 1976 to 2012. 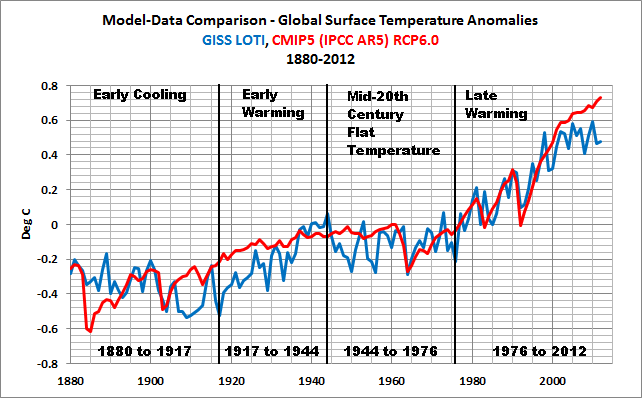 The models have overestimated the warming by about 28%. The divergence between the models and the data in recent years is evident. It’s no wonder James Hansen, now retired from GISS, used to hope for another super El Niño. 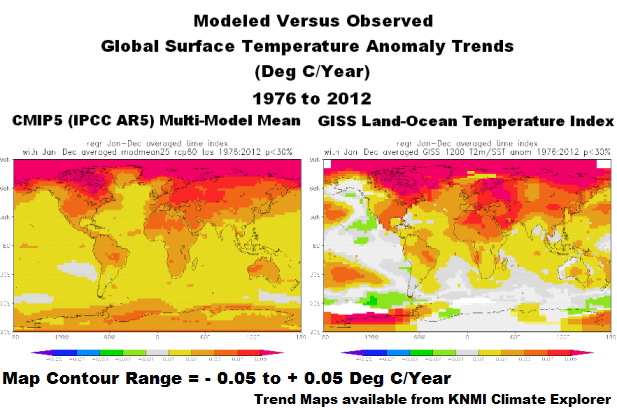 Figure 4 compares the modeled and observed surface temperature trend maps for 1976 to 2012. The models show warming for all of the East Pacific, while the data indicates little warming to cooling there. For the western and central longitudes of the Pacific, the models fail to show the ENSO-related warming of the Kuroshio-Oyashio Extension (KOE) east of Japan and the warming in the South Pacific Convergence Zone (SPCZ) east of Australia. The models also underestimate the warming in the mid-to-high latitudes of the North Atlantic. Modeled land surface temperature anomaly trends also show very limited abilities on regional bases, but that’s not surprising since the models simulate the sea surface temperature trends so poorly. 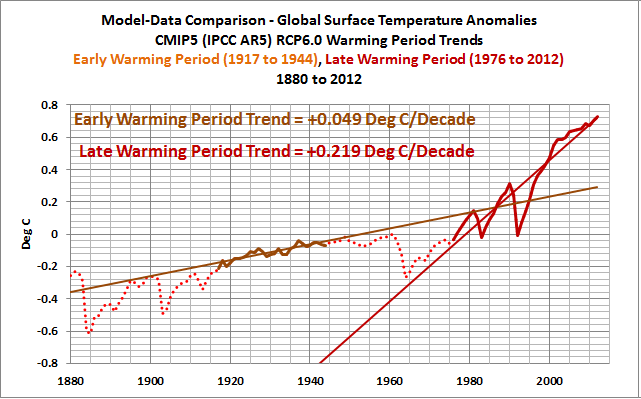 If we were to look only at the linear trends in the time-series graph, Figure 5, the modeled trend is not too far from the observed trend, only 0.026 deg C/decade. However, as discussed in the post Polar Amplification: Observations versus IPCC Climate Models, the climate models fail to present the polar amplified cooling that existed during this period. See Figure 6. (Yes, polar-amplified cooling exists in the Arctic during cooling periods, too.) The climate models failed to simulate the cooling at high latitudes of the North Pacific and in the mid-to-high latitudes of the North Atlantic. The climate models also failed to simulate the warming of sea surface temperatures in the Southern Hemisphere, and they missed the warming of Antarctica. Atrocious, horrible and horrendous are words that could be used to describe the performance of the CMIP5-archived climate models during the early warming period of 1917 to 1944. See Figure 7. According to the models, if greenhouse gases were responsible for global warming, global surface temperatures should only have warmed at a rate of about +0.049 deg C/decade. BUT according to the new and improved GISS Land-Ocean Temperature Index (LOTI) data, global surface temperatures warmed at a rate that was approximately 3.4 times faster or about 0.166 deg C/decade. That difference presents a number of problems for the hypothesis of human-induced, greenhouse gas-driven global warming, which we’ll discuss later in this post. Looking at the maps of modeled and observed trends, the models failed to simulate the general warming of sea surface temperatures from 1917 to 1944 and they failed to capture the polar amplified warming at high latitudes of the Northern Hemisphere. As discussed in the post about polar amplification that was linked earlier, the observed warming rates at high latitudes of the Northern Hemisphere were comparable during the early and late warming periods (See the graph here). 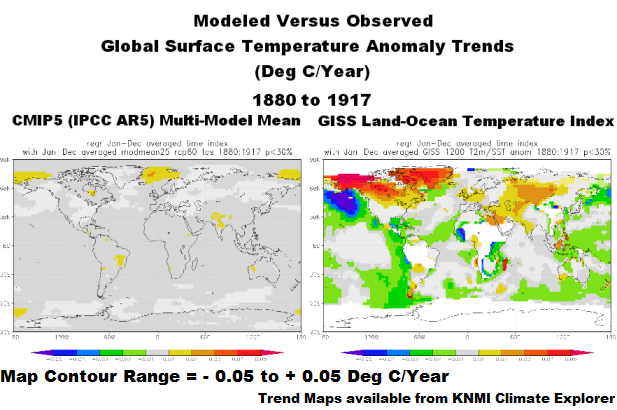 Note: Areas in white in the GISS map have no data or they don’t have sufficient data to perform the trend analyses, which I believe is a threshold of 50% in the KNMI Climate Explorer. If the data back this far in time is to be believed (that’s for you to decide), surface temperatures cooled, Figure 9, but the model simulations show they should have warmed slightly. The observations-based map in Figure 10 shows land and sea surface temperature trends seeming to be out of synch during this period—sea surface temperatures show cooling while land surface temperatures show warming in many areas. 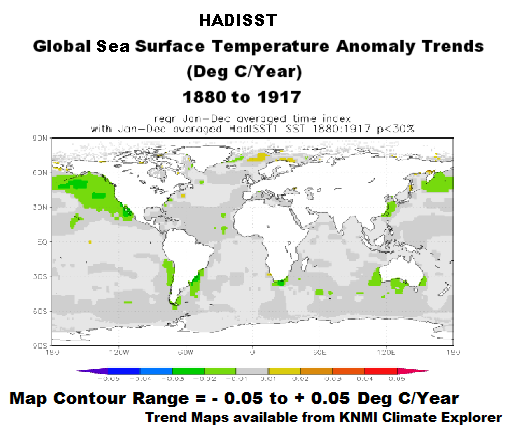 If GISS had kept HADISST as their sea surface temperature dataset for this period, the disparity between land and ocean trends would not have been as great. That is, the HADISST data they formerly used does not show that much cooling during this period. Ocean heat content data since 1955 and the satellite-era sea surface temperatures indicate the oceans warmed naturally. Refer to the illustrated essay “The Manmade Global Warming Challenge” (42mb). Climate models cannot simulate the observed rate of warming of global land air plus sea surface temperatures during the early warming period (1917-1944), which warmed at about the same rate as the recent warming period (1976-2012). The fact that the models simulate the warming better during the recent warming period does not indicate that manmade greenhouse gases were responsible for the warming—it only indicates the models were tuned to perform better during the recent warming period. The public should have little confidence in climate models, yet we are bombarded by the mainstream media almost daily with climate model-based conjecture and weather-related fairytales. Climate models have shown little to no ability to reproduce observed rates of warming and cooling of global temperatures over the term of the GISS Land Ocean Temperature Index. The IPCC clearly overstates its confidence in model simulations of the climate variable most commonly used to present the supposition of human-induced global warming (e.g., surface temperature). 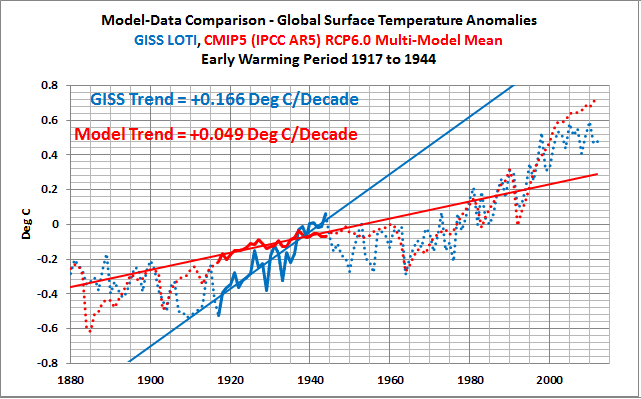 After several decades of development, models continue to show no skill at establishing that global warming is a response to increasing greenhouse gases. No skill whatsoever. The GISS LOTI data and the outputs of the CMIP5-archived models are available through the KNMI Climate Explorer. The difference between the GISS land-ocean temperature index data and the CMIP5 multi-model mean (Data Minus Model) is shown in Figure Supplement 1. The recent divergence of the models from observations has not yet reached the maximum differences that exist toward the beginning of the data—maybe in a few more years. The differences do of course depend on the base years used for anomalies. 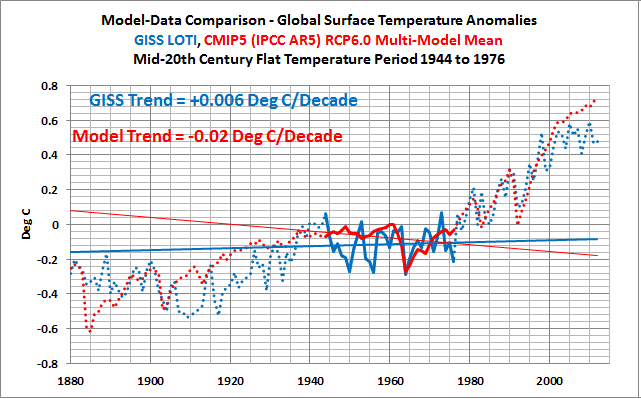 As noted in the post, I’ve used the base years of 1961-1990 to be consistent with the base period used by the IPCC in their model-data comparison in Figure 10.1 from the Second Order Draft of AR5. 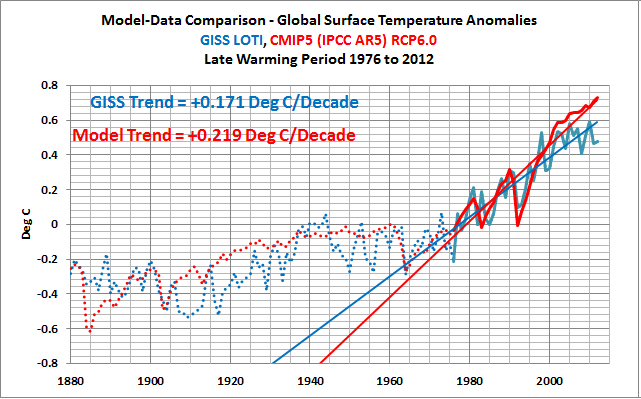 Using the base years of 1880 to 2012 (the entire term of the GISS data) does not help the models too much. Refer to Figure Supplement 2. The recent divergence is still considerable compared to those of the past. 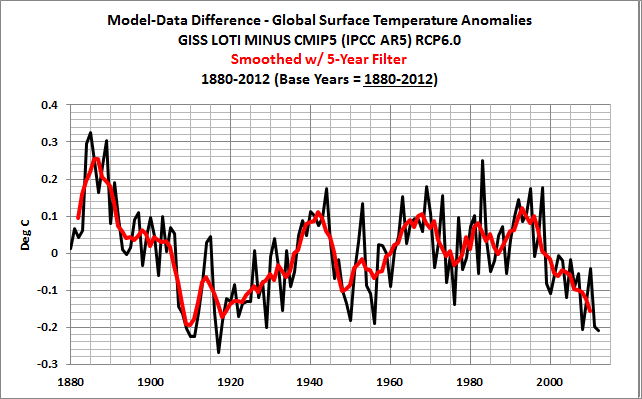 Pingback: Model-Data Difference – Global Surface Temperature Anomalies – GISS, HADCRUT4 & NCDC | Watts Up With That? I would make the boundary between the early cooling period and the early warming period 1909, not 1917. 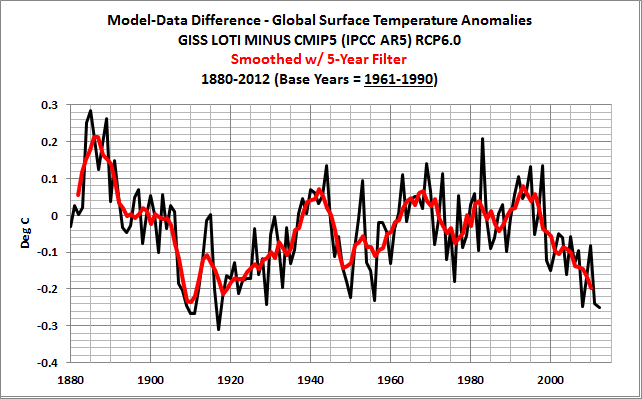 Smoothed global surface temperature according to GISS and HadCRUT3 was lower in 1909. This makes the length of the early warming period closer to that of the modern warming period, but decreases the slope of the early warming period. Pingback: Cowtan and Way (2013) Adjustments Exaggerate Climate Model Failings at the Poles and Do Little to Explain the Hiatus | Watts Up With That? Pingback: The Paris Paradigm: The What is your ‘Skeptic Score’? | Watts Up With That?